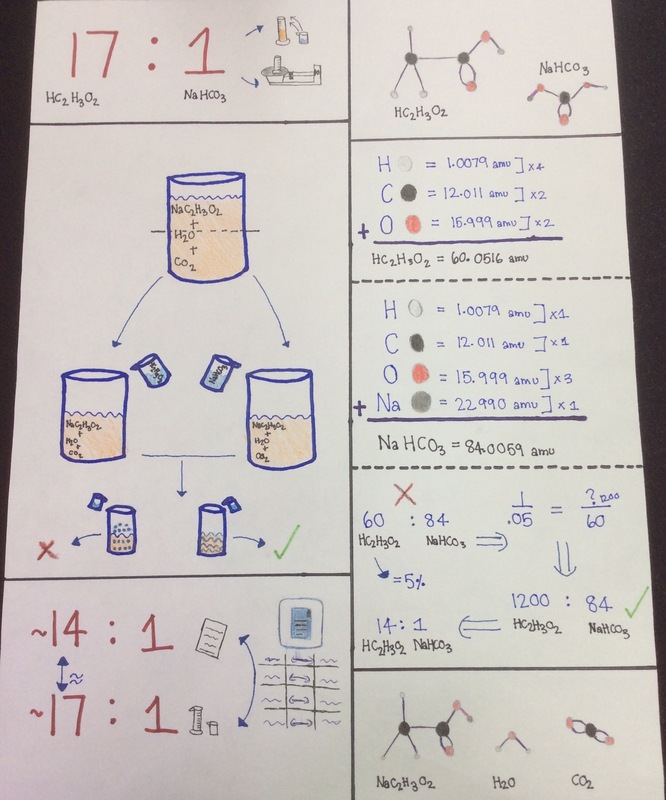 This is my poster explaining the process of the baking soda and vinegar experiment. I will basically explain my drawings to you. The top left section is telling us that by physically doing the experiment, it took me 17 grams of vinegar to dissolve 1 gram of baking soda. The section right below that tells us how I checked my work. So I had my solution, and I split it into half. Then, in one half I put baking soda. I put vinegar in the other. I wait some time and if no bubbling happens, then it indicates that the right solution has been found. If you put vinegar and then it bubbles, that means that you don’t have enough vinegar to dissolve the baking soda. If you put baking soda and it bubbles, that indicates excess vinegar. This gives us an idea on what we should do next. On the top right corner, there is a molecular model showing the baking soda and vinegar. If you look down to the bottom right corner, you will see a similar sight. But notice something different? It is now the new molecular structure after the reaction. The numbers on the right side are all theoretical calculations. It is combining the molecular weight of the baking soda and vinegar to come up with a ratio. That ratio is 14 grams of vinegar to 1 gram of baking soda. As you can see in the bottom left corner, the experimental and theoretical numbers are very similar. This is like our matter chart in google docs. Connecting theory with experiments. So this is my process of explaining the reaction of vinegar and baking soda. How often do you ask, when presented with a new claim from science, “how do they know?” How interested and motivated are you in following the evidence and argument? How curious are you? Do you investigate ideas on your own through sources that you find? How much reflection do you do–in writing in your DSN–about the ideas and experiences from classs With regard to ideas about matter, how relevant are these ideas to you–not just if you find them interesting or boring or confusing–but how is your life impacted by these ideas and facts of the properties and behavior of matter–and how humans have made use of these ideas and facts? What are your ambitions for continued learning in the area of chemistry/matter–high school, university, occupation, hobby, etc.? Relate perseverance to motivation, interest, boredom, difficulty, challenge? What are your strategies for nurturing interest and motivation with something that is difficult or boring? Do you call something boring when it is difficult? I think I need to just acknowledge the fact that science related ideas are hard to understand. I’m always looking for a straight forward answer, but these are concepts. They are not yes or no questions. Instead of trying to find the answer, I should fetch for the understanding of the concept. This idea is very important because it doesn’t only relate to science, but also to my daily life. All my situations don’t have right or wrong answers. They are conditional, have pros and cons, and don’t necessarily have any answer. I feel I ask a lot of questions in class. Any confusion that pops up, I’ll be the first one to ask about it. I ask questions all the time, everytime. I feel this shows my perseverance as I want to know more. I’m trying to dig in. This also indicates my enthusiasm and curiosity towards things. Asking questions is a key to perseverance and motivation. My initial idea of matter was that it needs to have mass. It needs weight. All matter can be felt and touched. My wondering that time was how could matter be transformed. Now I have the answer to one of my biggest confusion before. Matter can be changed through chemical reactions, or physical changes, or they can change their state through heating and freezing. I learned what chemical reactions are because first that was our hypothesis for the assessment. A chemical reaction is when two kifferent molecules form a new molecule. Also, these transformations can’t be undone. Those which can be undone are physical changes. We saw this through crystallization. We saw it through many examples of salt, copper sulfate, alum…Also, I learned that the process of the transformation of the state of the element can be done by heating and freezing. The heating process is called distillation. We wanted to do this to prove that the solution of ethanol, and water were from a physical change. Also, so can separate them in a physical change by freezing them. That’s what we did in the end. I feel I am getting closer to the thinking of a scientist, but I’m still very far away. There is a lot to learn before I reach that level.